This article is about the insects. For other uses including plants, see Locust (disambiguation). Locusts are certain species of short-horned grasshoppers in the family Acrididae that have a swarming phase. These insects are usually solitary, but under certain circumstances become more abundant and change their behaviour and habits, becoming gregarious. 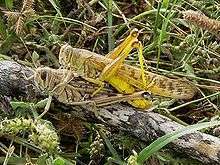 There is no taxonomic distinction between locust and grasshopper species; the basis for the definition is whether a species forms swarms under intermittently suitable conditions. In the solitary phase, these grasshoppers are innocuous, their numbers are low and they do not pose a major economic threat to agriculture. However, under suitable conditions of drought followed by rapid vegetation growth, serotonin in their brains triggers a dramatic set of changes: they start to breed abundantly, becoming gregarious and nomadic (loosely described as migratory) when their populations become dense enough. They form bands of wingless nymphs which later become swarms of winged adults. Both the bands and the swarms move around and rapidly strip fields and cause damage to crops. The adults are powerful fliers; they can travel great distances, consuming most of the green vegetation wherever the swarm settles. Locusts have formed plagues since prehistory. The Ancient Egyptians carved them on their tombs and the insects are mentioned in the Bible and the Quran. Swarms have devastated crops and been a contributory cause of famines and human migrations. More recently, changes in agricultural practices and better surveillance of locations where swarms tend to originate, have meant that control measures can be used at an early stage. The traditional means of control are based on the use of insecticides from the ground or the air, but other methods using biological control are proving effective. Swarming behaviour has decreased in the twentieth century, but despite modern surveillance and control methods, the potential for swarms to form is still present, and when suitable climatic conditions occur and vigilance lapses, plagues can still occur. Locusts are large insects and convenient for use in research and the study of zoology in the classroom. They are also edible insects; they have been eaten throughout history and are considered a delicacy in many countries. The word "locust" is derived from the Vulgar Latin locusta, meaning locust or lobster. Locusts are the swarming phase of certain species of short-horned grasshoppers in the family Acrididae. These insects are usually solitary, but under certain circumstances become more abundant and change their behaviour and habits, becoming gregarious. 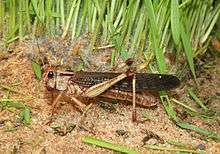 There is no taxonomic distinction between locust and grasshopper species; the basis for the definition is whether a species forms swarms under intermittently suitable conditions. In English the term "locust" is used for grasshopper species that change morphologically and behaviourally on crowding, forming swarms that develop from bands of immature stages called hoppers. These changes are examples of phase polymorphism; they were first analysed and described by Boris Uvarov who was instrumental in setting up the Anti-Locust Research Centre. He made his discoveries during his studies of the desert locust, whose solitary and gregarious phases had previously been thought to be separate species. He designated the two phases as solitaria and gregaria. These are also referred to as statary and migratory morphs, though strictly speaking their swarms are nomadic rather than migratory. Charles Valentine Riley and Norman Criddle were also involved in achieving the understanding and control of locusts. Swarming behaviour is a response to overcrowding. Increased tactile stimulation of the hind legs causes an increase in levels of serotonin. This causes the locust to change colour, eat much more, and breed much more easily. The transformation of the locust to the swarming form is induced by several contacts per minute over a four-hour period. A large swarm can consist of billions of locusts spread out over an area of thousands of square kilometres, with a population of up to eighty million individuals per square kilometre (two hundred million per square mile). It has been shown that when desert locusts meet, their nervous systems release serotonin, which causes them to become mutually attracted, a prerequisite for swarming. The initial bands of gregarious hoppers are known as "outbreaks" and when these join together into larger groups it is known as an "upsurge". Continuing agglomerations of upsurges on a regional level originating from a number of entirely separate breeding locations are known as "plagues". 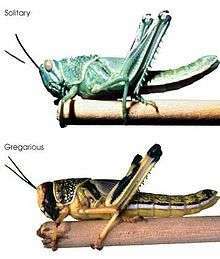 During outbreaks and the early stages of upsurges, only part of the locust population becomes gregarious, with scattered bands of hoppers spread out over a large area. As time goes by, the insects become more cohesive and the bands become concentrated in a smaller area. In the desert locust plague in Africa, the Middle East and Asia that lasted from 1966 to 1969, the number of locusts increased from two to thirty billion over two generations but the area covered decreased from over 100,000 square kilometres (39,000 sq mi) to 5,000 square kilometres (1,900 sq mi). One of the greatest differences between the solitary and gregarious phases is behavioural. The gregaria nymphs are attracted to each other, this being seen as early as the second instar. They soon form bands of many thousands of individuals. These groups behave like cohesive units and move across the landscape, mostly downhill, but making their way round barriers and merging with other bands. The attraction between the insects seems to be largely visual, but also involves olfactory cues, and the band seem to navigate using the sun. They pause to feed at intervals before resuming their march, and may cover tens of kilometres over a few weeks. There are also differences in morphology and development. In the desert locust and the migratory locust for example, the gregaria nymphs become darker with strongly contrasting yellow and black markings, they grow larger and have a longer developmental period. The adults are larger with different body proportions, less sexual dimorphism and a higher metabolic rate. They mature more rapidly and start reproducing earlier but have a lower level of fecundity. The mutual attraction between individual insects continues into adulthood and they continue to act as a cohesive group. Individuals that get detached from a swarm fly back into the mass. Others that get left behind after feeding, take-off to rejoin the swarm when it passes overhead. When individuals at the front of the swarm settle to feed, others fly past overhead and settle in their turn, the whole swarm acting like a rolling unit with an ever-changing leading edge. The locusts spend much time on the ground feeding and resting, moving on when the vegetation is exhausted. They may then fly a considerable distance before settling in a location where transitory rainfall has caused a green flush of new growth. Several species of grasshopper, including especially the following, swarm as locusts in different parts of the world, on all continents except Antarctica (and since the extinction of the Rocky Mountain locust, North America):[lower-alpha 1] For example, the Australian plague locust (Chortoicetes terminifera) swarms across Australia. The desert locust (Schistocerca gregaria) is probably the best known species owing to its wide distribution (North Africa, Middle East, and Indian subcontinent) and its ability to migrate over long distances. A major infestation covered much of western Africa in 2003-4, after unusually heavy rain set up favourable ecological conditions for swarming. The first outbreaks occurred in Mauritania, Mali, Niger and Sudan in the autumn of 2003. The rain allowed swarms to develop and move north to Morocco and Algeria, threatening croplands. Swarms crossed Africa, appearing in Egypt, Jordan and Israel, the first time in those countries for 50 years. The cost of handling the infestation was put at US $122 million, and the damage to crops at up to $2.5 billion. The migratory locust (Locusta migratoria), sometimes classified into up to ten subspecies, swarms in Africa, Asia, Australia and New Zealand, but has become rare in Europe. In 2013, the Madagascan form of the migratory locust formed many swarms of over a billion insects, reaching "plague" status and covering about half the country by March 2013. 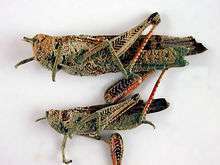 Species such as the Senegalese grasshopper (Oedaleus senegalensis) and the African rice grasshopper (Hieroglyphus daganensis), both from the Sahel, often display locust-like behaviour and change morphologically on crowding. Study of literature shows how pervasive plagues of locusts were over the course of history. The insects arrived unexpectedly, often after a change of wind direction or weather, and the consequences were devastating. The Ancient Egyptians carved locusts on tombs in the period 2470 to 2220 BC, and a devastating plague is mentioned in the Book of Exodus in the Bible, as taking place in Egypt around 1300 BC. Plagues of locusts are also mentioned in the Quran. In the ninth century BC, the Chinese authorities appointed anti-locust officers. Aristotle studied locusts and their breeding habits and Livy recorded a devastating plague in Capua in 203 BC. He mentioned human epidemics following locust plagues which he associated with the stench from the putrifying corpses; the linking of human disease outbreaks to locust plagues was widespread. A pestilence in China in 311 AD that killed 98% of the population locally was blamed on locusts, and may have been caused by an increase in numbers of rats (and their fleas) that devoured the locust carcases. During the last two millennia, locust plagues continued to appear at irregular intervals with the main recorded outbreaks of the desert and migratory locusts occurring in Africa, the Middle East and Europe. Other species of locust caused havoc in North and South America, Asia and Australasia. 173 outbreaks over a period of 1924 years have been recorded in China. The Bombay locust (Nomadacris succincta) was a major pest in India and southeastern Asia in the eighteenth and nineteenth centuries, but has seldom swarmed since the last plague in 1908. The extinction of the Rocky Mountain locust has been a source of puzzlement. It had swarmed throughout the west of the United States and parts of Canada in the nineteenth century. Albert's swarm of 1875 was estimated to cover 198,000 square miles (510,000 km2) (greater than the area of California) and to weigh 27.5 million tons, with some 12.5 trillion insects. The last specimen was seen alive in Canada in 1902. Recent research suggests the breeding grounds of this insect in the valleys of the Rocky Mountains came under sustained agricultural development during the large influx of gold miners, destroying the underground eggs of the locust. Early intervention is a more successful means of dealing with locusts than later action when swarms have already built up. The technology to control locust populations is now available, but the organisational, financial and political problems may be difficult to overcome. Monitoring is the key to reducing damage, with the early detection and eradication of nymphal bands being the objective. Ideally a sufficient proportion of nomadic bands can be treated with insecticide before the swarming phase is reached. Reaching this objective may be possible in richer countries like Morocco and Saudi Arabia, but neighbouring poorer countries lack the resources and may act as a source of locust swarms that threaten the whole region. Several organizations around the world monitor the threat from locusts. They provide forecasts detailing regions likely to suffer from locust plagues in the near future. In Australia this service is provided by the Australian Plague Locust Commission. It has been very successful with dealing with developing outbreaks but has the great advantage of having a defined area to monitor and defend without locust invasions from elsewhere. In Central and Southern Africa the service is provided by the International Locust Control Organization for Central and Southern Africa (IRLCO-CSA). In West and Northwest Africa the service is co-ordinated by the Food and Agriculture Organization's Commission for Controlling the Desert Locust in the Western Region (CLCPRO), and executed by locust control agencies belonging to each country concerned. The FAO also monitors the situation in the Caucasus and Central Asia, where over twenty-five million hectares of cultivated land are under threat. Historically there was little that people could do to protect their crops from being devastated by locusts, although eating the insects themselves may have been some consolation. By the early twentieth century, efforts were being made to disrupt the development of the insects by cultivating the soil where eggs were laid, collecting hoppers with catching machines, killing them with flame-throwers, trapping them in ditches, crushing them with rollers and other mechanical methods. By the 1950s, the organochloride Dieldrin was found to be an extremely effective insecticide but it was later banned from use in most countries because of its persistence in the environment and its bioaccumulation in the food chain. In years when locust control is needed, the hoppers are targeted in spring by applying water-based, contact pesticides using tractor-based sprayers. 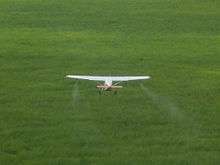 This is effective but slow and labour-intensive and it is preferable, where possible, to spray concentrated insecticide solutions from aircraft over the insects or the vegetation on which they feed. The use of ultra-low volume spraying of contact pesticides from aircraft in overlapping swathes is effective against nomadic bands and can be used to treat large areas of land swiftly. Other modern technologies used for planning locust control include GPS, GIS tools and satellite imagery, and computers provide rapid data management and analysis. A biological pesticide to control locusts was tested across Africa by a multinational team in 1997. Dried fungal spores of a Metarhizium species sprayed in breeding areas pierce the locust exoskeleton on germination and invade the body cavity, causing death. The fungus is passed from insect to insect and persists in the area, making repeated treatments unnecessary. This approach to locust control was used in Tanzania in 2009 to treat around 10,000 hectares in the Iku-Katavi National Park infested with adult locusts. The outbreak was contained and the elephants, hippopotamuses and giraffes present in the area were unharmed. The ultimate goal in locust control is the use of preventative and proactive methods that disrupt the environment to the least possible extent. This would make agricultural production easier and more secure in the many regions where growing crops is of vital importance to the survival of the local people. 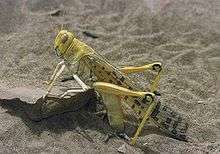 The locust is large, easy to breed and rear and is used as an experimental model in research studies. It has been used in evolutionary biology research and to discover to what degree conclusions reached about other organisms, such as the fruit fly (Drosophila) and the housefly (Musca), are applicable to all insects. It is a suitable school laboratory animal because of its robustness and the ease with which it can be grown and handled. 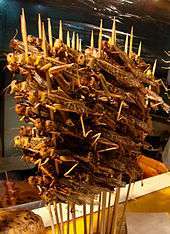 Several cultures throughout the world consume insects, and locusts are considered a delicacy and eaten in many African, Middle Eastern and Asian countries. They have been used as food throughout history. They can be cooked in many ways but are often fried, smoked or dried. It is recorded in the Bible that John the Baptist ate locusts and wild honey (Greek: ἀκρίδες καὶ μέλι ἄγριον, akrides kai meli agrion) while living in the wilderness; attempts have been made to explain the locusts as suitably ascetic vegetarian food such as carob beans, but the plain meaning of ἀκρίδες is the insects. The Torah, although disallowing the use of most insects as food, permits the consumption of certain locusts; specifically, the red, the yellow, the spotted grey and the white are considered permissible. In Islamic jurisprudence, eating locusts is considered halal. The Prophet Muhammad was reported to have eaten locusts during a military raid with his companions. Locusts are eaten in the Arabian Peninsula, including Saudi Arabia, where consumption of locusts spiked around Ramadan in the Al-Qassim Region and Ha'il Region in 2014 since many Saudis believe they are healthy to eat; however, the Saudi Ministry of Health warned that pesticides they used against the locusts made them unsafe; and Kuwait. Yemenis also consume locusts, and expressed discontent over governmental plans to use pesticides to control them. 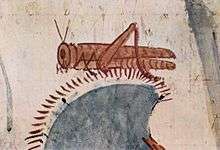 ʻAbd al-Salâm Shabînî described a locust recipe from Morocco. 19th century European travellers observed Arabs in Arabia, Egypt, and Morocco selling, cooking, and eating locusts. They reported that in Egypt and Palestine locusts were consumed. They reported that in Palestine, around the river Jordan, in Egypt, in Arabia, and in Morocco that Arabs ate locusts, while Syrian peasants did not eat locusts. However, in the Haouran region, Fellahs who were in poverty and suffered from famine ate locusts after removing the guts and head, while locusts were swallowed wholesale by Bedouins. Syrians, Copts, Greeks, Armenians and other Christians and Arabs themselves reported that in Arabia locusts were eaten frequently and one Arab described to a European traveler the different types of locusts which were favored as food by Arabs. Persians use the Anti-Arab racial slur "Arabe malakh-khor" (Persian: عرب ملخ خور‎‎, lit. Arab locust eater) against Arabs. Locusts yield about five times as much edible protein per unit of fodder as cattle, and produce lower levels of greenhouse gases in the process. The feed conversion rate of orthopterans is 1.7 kg/kg, while for beef it is typically about 10 kg/kg. The protein content in fresh weight is between 13–28 g/100g for adult locust, 14–18 g/100g for larvae, as compared to 19–26 g/100g for beef. The calculated protein efficiency ratio is however low, with 1.69 for locust protein compared to 2.5 for standard casein. 100 g of desert locust provides 11.5 g of fat, 53.5% of which is unsaturated, and 286 mg of cholesterol. Among the fatty acids, palmitoleic, oleic and linolenic acids were found to be the most abundant. Varying amounts of potassium, sodium, phosphorus, calcium, magnesium, iron and zinc were present. ↑ The American locust (Schistocerca americana) does not swarm. ↑ Antsey, Michael; Rogers, Stephen; Swidbert, RO; Burrows, Malcolm; Simpson, SJ (January 30, 2009). "Serotonin mediates behavioral gregarization underlying swarm formation in desert locusts.". Science. 323 (5914): 627–630. doi:10.1126/science.1165939. PMID 19179529. Retrieved 2 October 2016. ↑ "Online Etymology Dictionary". Etymonline.com. Retrieved 12 October 2011. ↑ "Frequently Asked Questions (FAQs) about locusts". Locust watch. FAO. Retrieved 1 April 2015. ↑ "Grasshoppers". Animal Corner. Retrieved 1 April 2015. ↑ Reed Business Information (20 April 1972). New Scientist. Reed Business Information. p. 156. ISSN 0262-4079. 1 2 3 4 Dingle, Hugh (1996). Migration : The Biology of Life on the Move. Oxford University Press. pp. 273–274. ISBN 978-0-19-535827-8. ↑ Holliday, N.J. (1 February 2006). "Norman Criddle: Pioneer Entomologist of the Prairies". Manitoba History. Manitoba Historical Society. Retrieved 16 April 2015. ↑ James Morgan (January 29, 2009). "Locust swarms 'high' on serotonin". BBC News. Archived from the original on October 10, 2013. Retrieved March 4, 2014. 1 2 3 Showler, Allan T. (2008). "Desert locust, Schistocerca gregaria Forskål (Orthoptera: Acrididae) plagues". In John L. Capinera. Encyclopedia of Entomology. Springer. pp. 1181–1186. ISBN 978-1-4020-6242-1. ↑ P. A. Stevenson (January 2009). "The key to Pandora's box". Science. 323 (5914): 594–595. doi:10.1126/science.1169280. PMID 19179520. ↑ Ewen Callaway (January 29, 2009). "Blocking 'happiness' chemical may prevent locust plagues". New scientist. Retrieved January 31, 2009. 1 2 Showler, Allan T. (4 March 2013). "The Desert Locust in Africa and Western Asia: Complexities of War, Politics, Perilous Terrain, and Development". Radcliffe's IPM World Textbook. University of Minnesota. Retrieved 3 April 2015. 1 2 3 4 Krall, S.; Peveling, R.; Diallo,B.D. (1997). New Strategies in Locust Control. Springer Science & Business Media. pp. 453–454. ISBN 978-3-7643-5442-8. 1 2 3 Harmon, Katherine (30 January 2009). "When Grasshoppers Go Biblical: Serotonin Causes Locusts to Swarm". Scientific American. Retrieved 7 April 2015. ↑ Alexandra M. Wagner (Winter 2008). "Grasshoppered: America's response to the 1874 Rocky Mountain locust invasion". Nebraska History. 89 (4): 154–167. ↑ Yoon, Carol Kaesuk (23 April 2002). "Looking Back at the Days of the Locust". The New York Times. Retrieved 1 April 2015. ↑ Thomas, M. C. The American grasshopper, Schistocerca americana americana (Drury) (Orthoptera: Acrididae). Entomology Circular No. 342. Florida Department of Agriculture and Consumer Services. May, 1991. ↑ "FAO issues Desert Locust alert: Mauritania, Niger, Sudan and other neighbouring countries at risk". Rome: Food and Agriculture Organization. 20 October 2003. Retrieved 3 July 2015. ↑ "Desert Locusts Plague West Africa". NPR. 15 November 2004. Retrieved 3 July 2015. ↑ "Desert Locust Archives 2003". Food and Agriculture Organization. Retrieved 3 July 2015. ↑ "Desert Locust Archives 2004". Food and Agriculture Organization. Retrieved 3 July 2015. 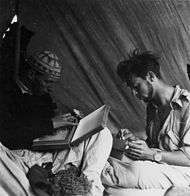 ↑ "The Desert Locust Outbreak in West Africa". OECD. 23 September 2004. Retrieved 3 July 2015. ↑ Chapuis, M-P.; Lecoq, M.; Michalakis, Y.; Loiseau, A.; Sword, G. A.; Piry, S.; Estoup, A. (1 August 2008). "Do outbreaks affect genetic population structure? A worldwide survey in a pest plagued by microsatellite null alleles". Molecular Ecology. 17 (16): 3640–3653. doi:10.1111/j.1365-294X.2008.03869.x. ↑ Greg Botelho (March 28, 2013). 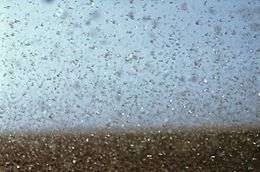 "Plague of locusts infests impoverished Madagascar". CNN. Retrieved March 29, 2013. 1 2 Uvarov, B.P. (1966). "Phase polymorphism". Grasshoppers and Locusts (Vol. 1). Cambridge University Press. ↑ Book of Exodus. pp. 10: 13–15. And Moses stretched forth his rod over the land of Egypt, and the Lord brought an east wind upon the land all that day, and all that night; and when it was morning, the east wind brought the locusts. 14 And the locust went up over all the land of Egypt, and rested in all the coasts of Egypt: very grievous were they; before them there were no such locusts as they, neither after them shall be such. 15 For they covered the face of the whole earth, so that the land was darkened; and they did eat every herb of the land, and all the fruit of the trees which the hail had left: and there remained not any green thing in the trees, or in the herbs of the field, through all the land of Egypt. 1 2 Spinage, Clive (2012). African Ecology: Benchmarks and Historical Perspectives. Springer Science & Business Media. pp. 481, 533–. ISBN 978-3-642-22871-1. ↑ "Bombay locust - Nomadacris succincta". Locust Handbook. Humanity Development Library. Retrieved 3 April 2015. ↑ "Melanoplus spretus, Rocky Mountain grasshopper". Animal Diversity Web. University of Michigan Museum of Zoology. Retrieved 2009-04-16. ↑ Ryckman, Lisa Levitt (22 June 1999). "The great locust mystery". Rocky Mountain News. Archived from the original on February 28, 2007. Retrieved 20 May 2007. ↑ Jeffrey A. Lockwood (2005). 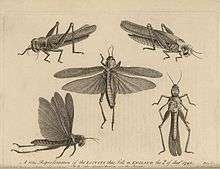 Locust: the Devastating Rise and Mysterious Disappearance of the Insect that Shaped the American Frontier. Basic Books. ISBN 978-0-465-04167-1. ↑ "Role of the Australian Plague Locust Commission". Department of Agriculture, Forestry and Fisheries. Commonwealth of Australia. 14 June 2011. Retrieved 2 April 2015. 1 2 Krall, S.; Peveling, R.; Diallo, B.D. (1997). New Strategies in Locust Control. Springer Science & Business Media. pp. 4–6. ISBN 978-3-7643-5442-8. 1 2 "Red Locust disaster in Eastern Africa prevented". Food and Agriculture Organization. 24 June 2009. Retrieved 1 April 2015. ↑ "Countries take responsibility for regional desert locust control". FAO. 2015. Retrieved 2 April 2015. ↑ "Locusts in Caucasus and Central Asia". Locust Watch. Food and Agriculture Organization. Retrieved 2 April 2015. ↑ "Control". Locusts in Caucasus and Central Asia. Food and Agriculture Organization. Retrieved 2 April 2015. ↑ Ceccato, Pietro. "Operational Early Warning System Using Spot-Vegetation And Terra-Modis To Predict Desert Locust Outbreaks" (PDF). Food and Agriculture Organization. Archived from the original (PDF) on 10 May 2015. Retrieved 5 March 2016. ↑ Latchininsky, Alexandre V.; Sivanpillai, Ramesh (2010). "Locust Habitat Monitoring And Risk Assessment Using Remote Sensing And GIS Technologies" (PDF). University of Wyoming. Archived from the original (PDF) on 30 December 2015. Retrieved 5 March 2016. ↑ "CSIRO ScienceImage 1367 Locusts attacked by the fungus Metarhizium". CSIRO. Retrieved 1 April 2015. ↑ Lomer, C.J. ; Bateman, R.P. ; Johnson, D.L. ; Langewald, J.; Thomas, M. (2001). "Biological Control of Locusts and Grasshoppers". Annual Review of Entomology. 46: 667–702. doi:10.1146/annurev.ento.46.1.667. PMID 11112183. ↑ Kellogg, Elizabeth A.; Shaffer, H. Bradley (1993). "Model Organisms in Evolutionary Studies". Systematic Biology. 42 (4): 409–414. doi:10.2307/2992481. ↑ Scott, Jon (March 2005). "The locust jump: an integrated laboratory investigation". Advances in Physiology Education. 29 (1): 21–26. doi:10.1152/advan.00037.2004. PMID 15718379. The relative size and robustness of the locust make it simple to handle and ideal for such investigations. ↑ Fromme, Alison (2005). "Edible Insects". Smithsonian Zoogoer. Smithsonian Institution. 34 (4). Archived from the original on November 11, 2005. Retrieved 26 April 2015. ↑ Dubois, Sirah (24 October 2011). "The Nutritional Value of Locusts". Livestrong.com. Retrieved 12 April 2015. ↑ Brock, Sebastian. "St John the Baptist's diet - according to some early Eastern Christian sources" (PDF). St John's College, Oxford. Retrieved 4 May 2015. ↑ Kelhoffer, James A. (2004). "Did John The Baptist Eat Like A Former Essene? Locust-Eating In The Ancient Near East And At Qumran". Dead Sea Discoveries. 11 (3): 293–314. doi:10.1163/1568517042643756. JSTOR 4193332. There is no reason, however, to question the plausibility of Mark 1:6c, that John regularly ate these foods while in the wilderness. ↑ "Are locusts really Kosher?! « Ask The Rabbi « Ohr Somayach". Ohr.edu. Retrieved 12 April 2015. ↑ Hebblethwaite, Cordelia (21 March 2013). "Eating locusts: The crunchy, kosher snack taking Israel by swarm". BBC News: Magazine. Retrieved 12 April 2015. ↑ "The Fiqh of Halal and Haram Animals". Shariahprogram.ca. Retrieved 12 April 2015. ↑ Hebblethwaite, Cordelia (21 March 2013). "Eating locusts: The crunchy, kosher snack taking Israel by swarm". BBC News. Retrieved 8 November 2016. ↑ Bukhari, Volume 7, Book 67: Hunting, Slaughtering. Retrieved 8 November 2016. 403: Narrated Ibn Abi Aufa: We participated with the Prophet in six or seven Ghazawat, and we used to eat locusts with him. ↑ "من المدخرات الغذائية في الماضي «الجراد»". www.al-jazirah.com. Al-Jazirah Newspaper. 2 December 2001. Retrieved 8 November 2016. ↑ "سوق الجراد في بريدة يشهد تداولات كبيرة والزراعة تحذرمن التسمم". صحيفة عاجل الإلكترونية. 11 December 2012. Retrieved 8 November 2016. ↑ "People told not to eat pesticide-laced locusts". Arab News. 2013-04-04. Retrieved 2016-01-08. ↑ أحلام الهمداني (5 March 2007). "اليمن تكافح الجراد بـ400 مليون واليمنيون مستاءون من (قطع الأرزاق)". www.nabanews.net. نبأ نيوز. Retrieved 8 November 2016. ↑ El Hage Abd Salam Shabeeny (1820). An account of Timbuctoo and Housa: territories in the interior of Africa. pp. 222–. ↑ Edward Robinson (1835). A Dictionary of the Holy Bible, for the Use of Schools and Young Persons. Crocker and Brewster. pp. 192–. ↑ Augustin Calmet (1832). Dictionary of the Holy Bible by Charles Taylor. Holdsworth and Ball. pp. 604–605. ↑ Augustin Calmet (1832). Dictionary of the Holy Bible. Crocker and Brewster. pp. 635–. ↑ Oriental Literatur Applied To The Illustration Of The Sacred Scriptures; Especially With Reference To Antiquties, Traditions And Manners (etc.). Longman, Hurst. 1822. pp. 213–. ↑ ... Description of Arabia Made from Personal Observations and Information Collected on the Spot by Carsten Niebuhr. 1889. pp. 57–. ↑ Nasrin Rahimieh (27 August 2015). Iranian Culture: Representation and Identity. Routledge. pp. 133–. ISBN 978-1-317-42935-7. ↑ "Persians v Arabs Same old sneers Nationalist feeling on both sides of the Gulf is as prickly as ever". The Economist. 2012-05-05. ↑ Hooman Majd (23 September 2008). The Ayatollah Begs to Differ: The Paradox of Modern Iran. Knopf Doubleday Publishing Group. pp. 165–. ISBN 978-0-385-52842-9. ↑ Global Steak – Demain nos enfants mangeront des criquets (2010 French documentary). ↑ A., Collavo; Glew, R. H.; Huang, Y. S.; Chuang, L. T.; Bosse, R.; Paoletti, M. G. (2005). "House cricket small-scale farming". In Paoletti, M. G. Ecological implications of minilivestock: potential of insects, rodents, frogs and snails. New Hampshire: Science Publishers. pp. 519–544. ↑ Smil, V. (2002). "Worldwide transformation of diets, burdens of meat production and opportunities for novel food proteins". Enzyme and Microbial Technology. 30: 305–311. doi:10.1016/s0141-0229(01)00504-x. ↑ "Composition database for Biodiversity Version 2, BioFoodComp2". FAO. 2013-01-10. Retrieved 2015-04-01. ↑ "nutritional value of insects for human consumption" (PDF). FAO. Retrieved 1 April 2015. 1 2 3 Abul-Tarboush, Hamza M.; Al-Kahtani, Hassan A.; Aldryhim, Yousif N.; Asif, Mohammed (2010-12-16). "Desert Locust (Schistocercsa gregaria): Proximate Composition, Physiochemcial Characteristics of Lipids, Fatty Acids and Cholesterol Contents and Nutritional Value of Protein" (Article). College of Foods And Agricultural Science. King Saud University. Retrieved 2015-01-21. Look up locust in Wiktionary, the free dictionary. Wikimedia Commons has media related to Caelifera.